Move over black liner – summer calls for colour. 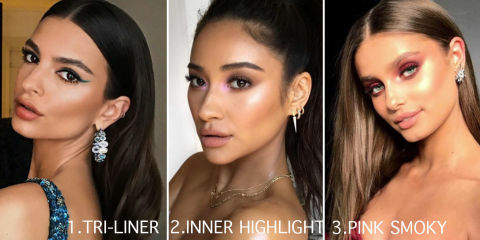 To tackle this trend, first do your eye base and mascara as usual (we used the newRevlon Mega Multiplier Mascara, which combines tubing and fibres for fat lashes that can be built upon when dry) and then follow the three steps below. – Using a navy eyeliner like theSmashbox Always On Gel Eye Liner in Bouncer, apply your first line tight to the lashes, and winged out as far as the length of your brows. – Next, trace that line with an aqua green colour like theRevlon ColorStay 2 in 1 Angled Kajal in Evergreen, overlapping the original liner slightly so it leaves half of the navy line exposed. – Sweep a gold eyeliner (such as theUrban Decay 24/7 Glide On Eye Pencil in Scorch) or cream shadow (like theRevlon ColorStay Crème Eye Shadow in Caramel, underneath the lower lash lines. An inner eye highlight is one of the oldest awakening tricks in the book. This season, try it with a subtle flash of colour which is more interestingandflattering than a pure white shade. This works with any eye make-up look – be it bare or smoky – so do that first, then follow the below and finish with mascara. – Apply a reflective base to the tear duct such as theRevlon ColorStay Crème Eye Shadow in Crème Brulee. This will make the accent last much longer. Pink is the new black when it comes to a smoky eye – but that doesn’t apply to mascara. Use eye shadow or blusher to give your lids a rosy kiss, just don’t forget to define your lashes to detract from a bad night’s sleep instead of enhancing one. – Apply a cream base such as theRevlon PhotoReady Insta-Blush in Berry Kiss, all over the eyelids.